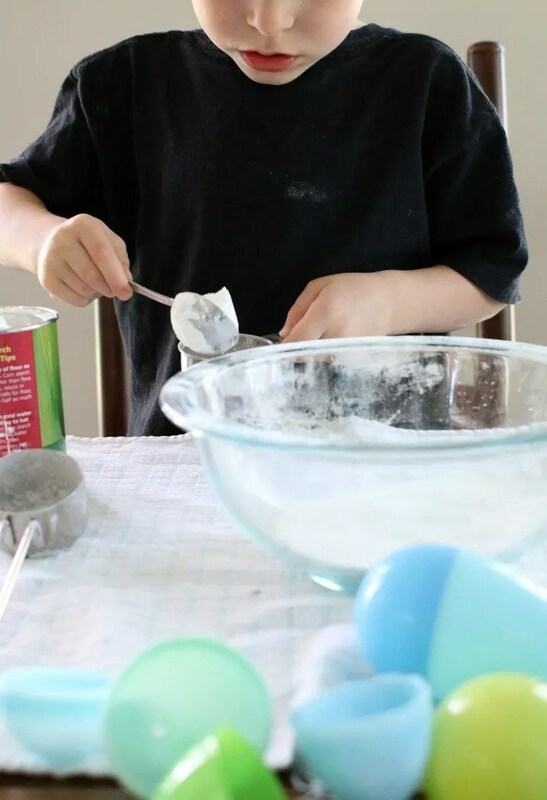 Before putting away the Easter eggs, the boys and I whipped up these simple DIY bath bombs. 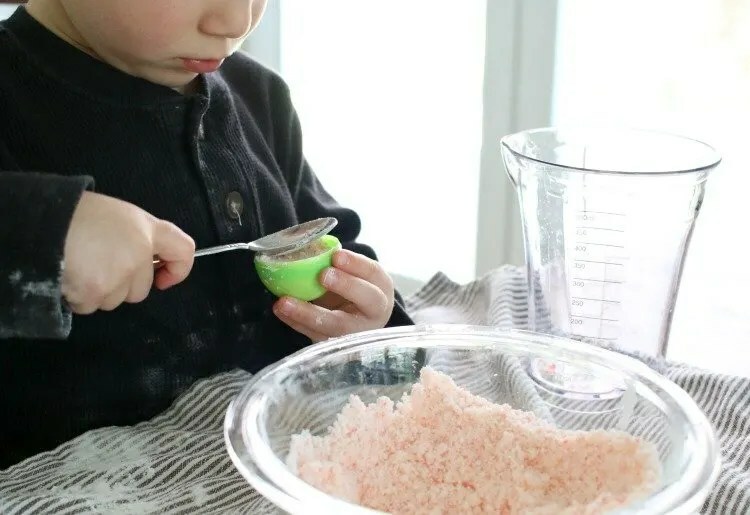 With simple and clean ingredients, most kids can make these DIY bath bombs with just a bit of supervision from adults. 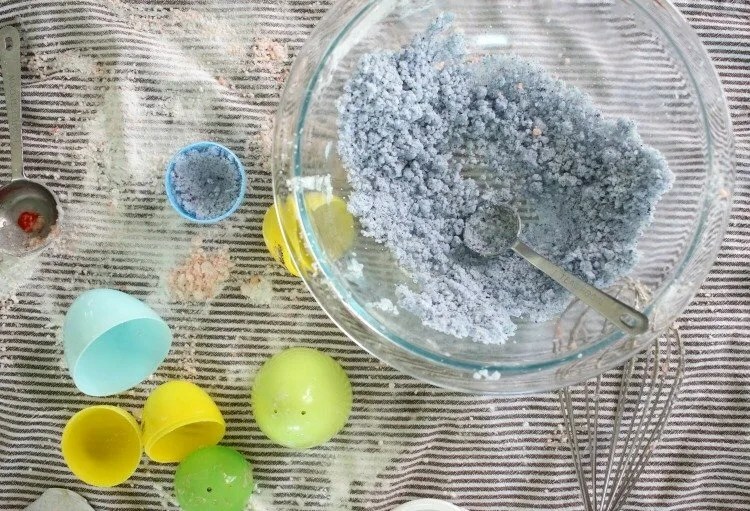 Those Easter eggs that collect dust in our closets can be put to good use any time of year. You’ve probably already put away all the Easter decor and baskets. 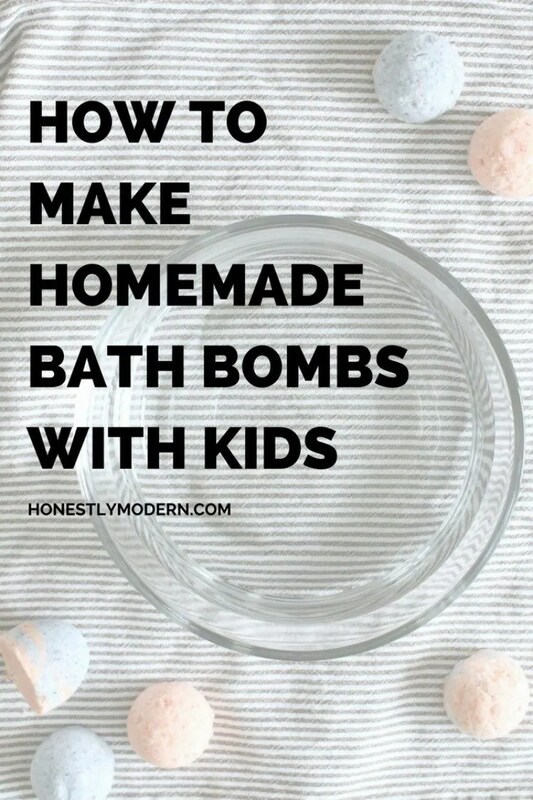 Even so, you can always dig them back out because they’re the perfect size and shape to make fun bath bombs with the kids. A couple of weeks ago, in the grocery store, T saw a shelf of bath bombs individually wrapped in plastic. If you’re not familiar with bath bombs, they’re concoctions of ingredients that, when dropped in a bath, fizz up and release nice, relaxing aromas into the air and water. As of late, they’ve been all the rage. Depending on how they are manufactured, they’re sometimes made of mostly clean ingredients. But it’s not uncommon for them to include a whole bunch of ingredients that really aren’t that great for us. So much for a relaxing and restorative bath full of chemicals and junk?! 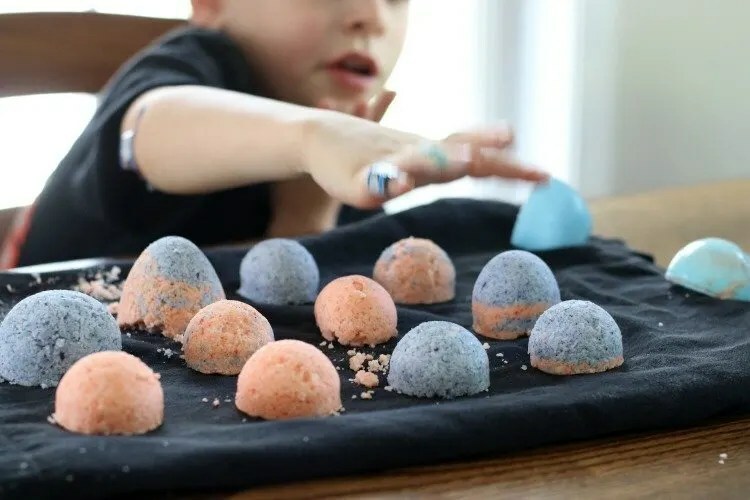 As an alternative to decoding a bunch of ingredients and (sometimes) overpaying for commercial bath bombs, the boys and I decided to make our own. They’re so easy, and the boys have a blast doing these types of projects. 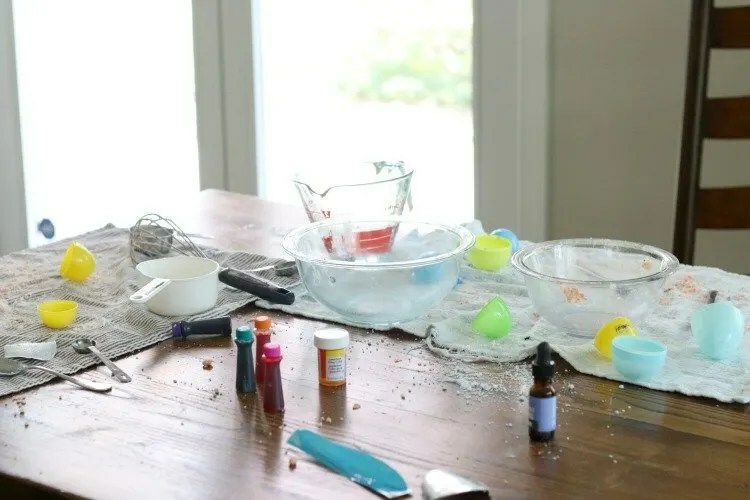 T and I made a batch years ago from a Green Kid Crafts kit, and he couldn’t get enough of the fizzing in the tub. I don’t have the recipe for the Green Craft Kids kit anymore, so we decided to use an adaptation of a recipe I received from ConsumerSafety.org. Consumer Safety is an organization that “strives to make information about recalls and safety-related news about drugs, medical devices, food, and consumer products accessible to everyone in a transparent, easily understandable way.” The site provides myriad avenues for obtaining recall and safety information, government policy activity related to safety, and more. Glitter ~ not only does this send small pieces of plastic into our water system, but do we really want that in our baths??! Increasingly, holistic and natural beauty companies are introducing new products to the market that offer more opportunities to avoid the junky ingredients that we should be avoiding. But making our own, particularly because they are so easy, is such a fun and simple, healthier alternative. With nearly all the ingredients on hand (we had to buy cornstarch), the boys and I made our own batch of bath bombs a couple weekends ago. We put all the chocolate covered raisins and chocolate covered pretzels from the eggs into a container (after eating quite a few, of course) and used the eggs as molds. We let the bath bombs dry overnight and then the boys couldn’t wait to try them in their baths the next day. It kept them entertained for a quite a while, so no complaints from me about that. If you need ingredients, you can pick them all up on Amazon. Here are all the ingredients and tools we used. Try this project and renew the life in the plastic eggs that almost all of us have collected over the years. 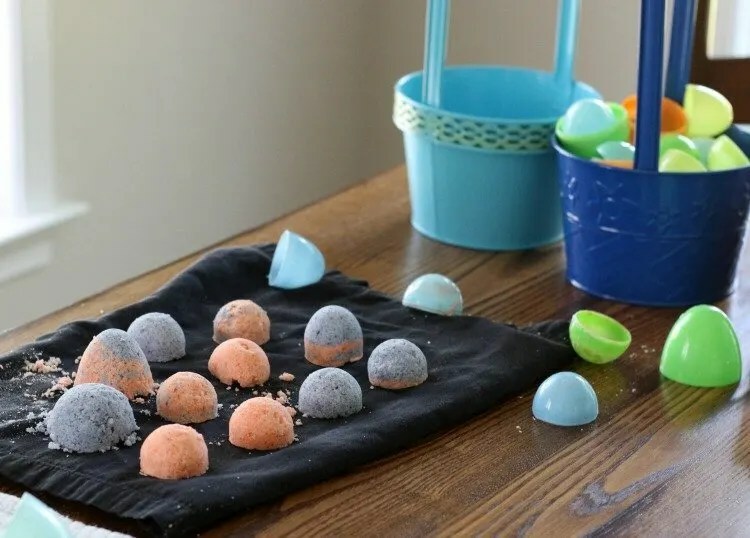 The eggs are a perfect shape and size for bath bombs, and it’s a fun way to put the seasonal toys to work outside of the Easter season. Of course, don’t forget to check out the linked posts below and share you own! In another bowl, mix together the wet ingredients (coconut oil through water). 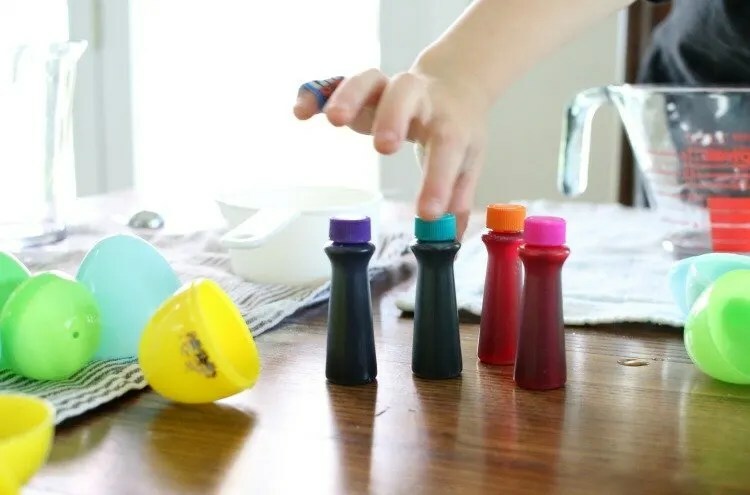 If you’re using regular food coloring, mix with the wet ingredients. 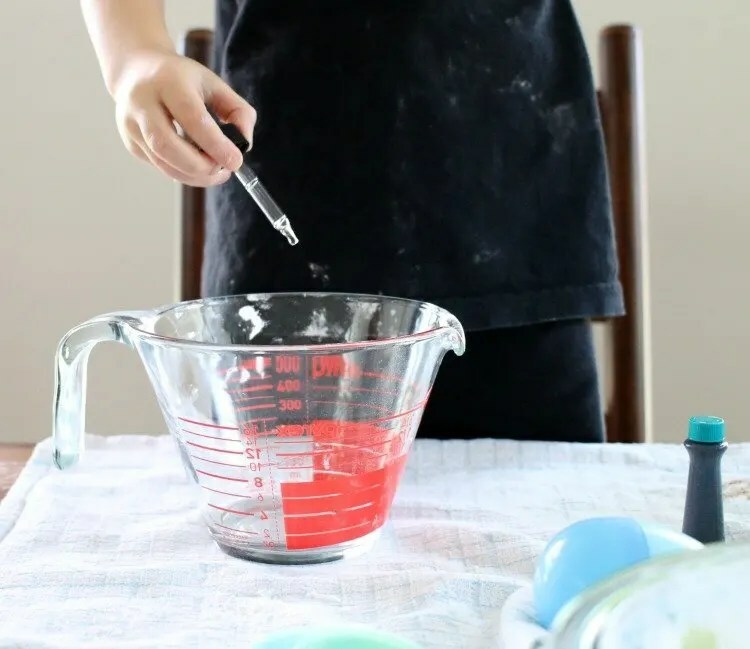 If using food coloring gel (like we did, because it’s what we had on hand), mix in after combining wet and dry ingredients. Slowly mix together the wet and dry ingredients. Whisk together all ingredients until the mixture forms a crumbly texture. It should be fairly dry but just wet enough to hold its shape when molded together. Use fingertips, as needed, to knead together the mixture after whisking. 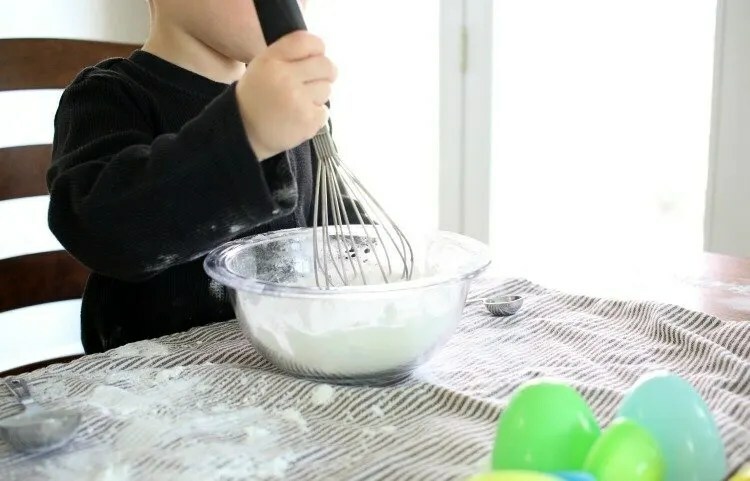 Fill the eggshell with the mixture, patting down tightly after to ensure it sticks together It has to be really tightly packed or it will fall apart when you remove it from the egg shells. My boys needed an adult to help with this step. Allow to sit and dry overnight on a towel. Such a good question because I’m pretty sure my little guys spilled a bunch of it all over the floor. Haha. If I recall, I think it made about 18 or so 1/2 eggs. It might be more, but I think that’s a safe conservative estimate. This is such a great idea for your class! I’m so glad you found it and are using it. I hope the project turns out really well!! Sorry about that. It looks like the water step was removed but I added it back. Thanks for letting me know! How did these fizz up? I notice this recipe is a little different from others I’ve seen, so just wondering how it compares. Hey Allison – Thanks for inquiring. They aren’t quite as fizzy as store-bought ones, but our boys really love them and love how they change the water colors. 🙂 Hope that helps. Hi Carolyn – Thanks for bringing this to my attention. I definitely had a typo because “tsps??”. That should have been drops, and I’m sorry about that. I did some further research and agree that the lavender essential oil might not be ideal. I updated the recipe to remove the essential oils (which I don’t think are all that necessary anyway). I appreciate the feedback. That’s awesome! I hope you have so much fun. Can I use regular salt instead of Epsom Salt? Hi Nina – Epsom salt and regular are not interchangeable. They are only called “salts” because they are a certain type of chemical compounds, but I don’t think you’ll want to use regular salt in these bath bombs. Thanks for asking! Thanks! We made them again and I updated the recipe.